Recurring order Schedule orders in advance and save time on products you buy frequently. Too much of a good thing can do the same amount of damage as a too little of it. 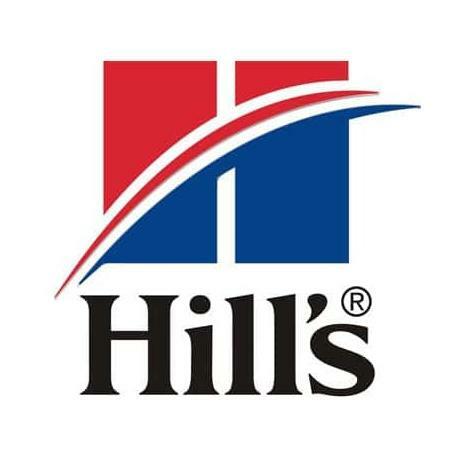 Hill’s thoroughly researched the precise amount and combination of nutrients to satisfy your cat throughout his different life stages. 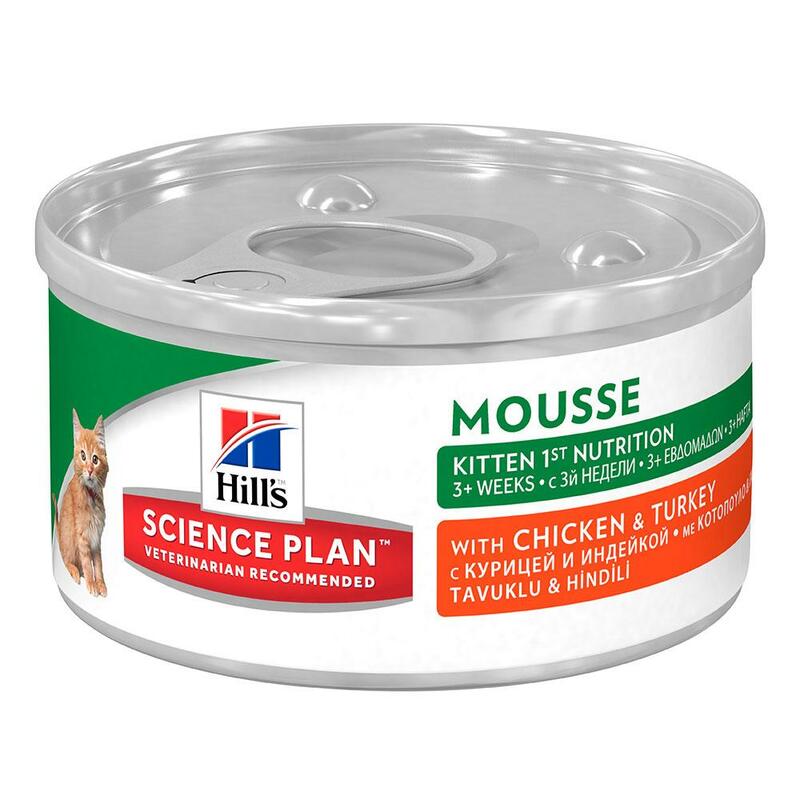 Weaning and young kittens still need help processing solids and Hill’s nutritional mousse is perfect for sensitive tummies – it digests easily and will boost your kitten’s natural defences. 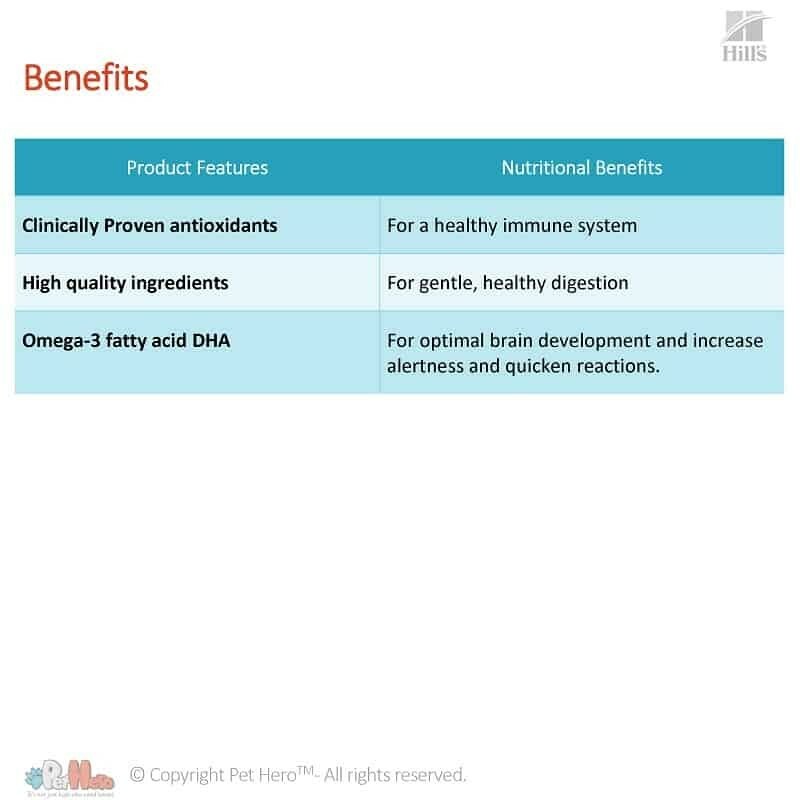 Omega-3 fatty acid DHA for optimal brain development and increased alertness and quicken reactions. 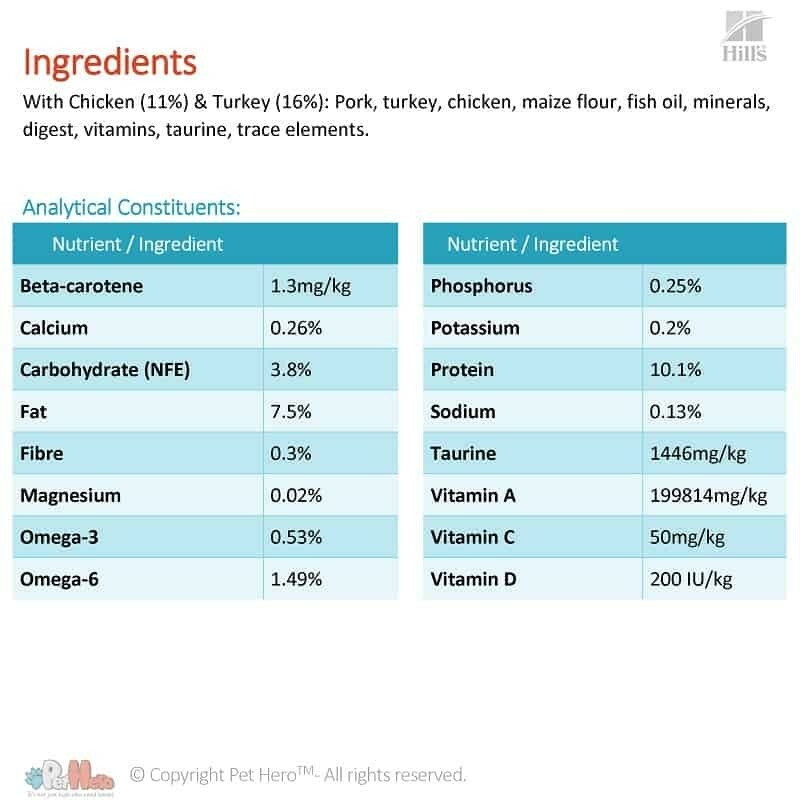 With Chicken (11%) & Turkey (16%): Pork, turkey, chicken, maize flour, fish oil, minerals, digest, vitamins, taurine, trace elements. Calcium – Builds strong bones, keeps nails, teeth and coat healthy. Required for digestion, blood clotting, squeezing and relaxing muscles, releasing hormones. And it helps to maintain a regular heartbeat. 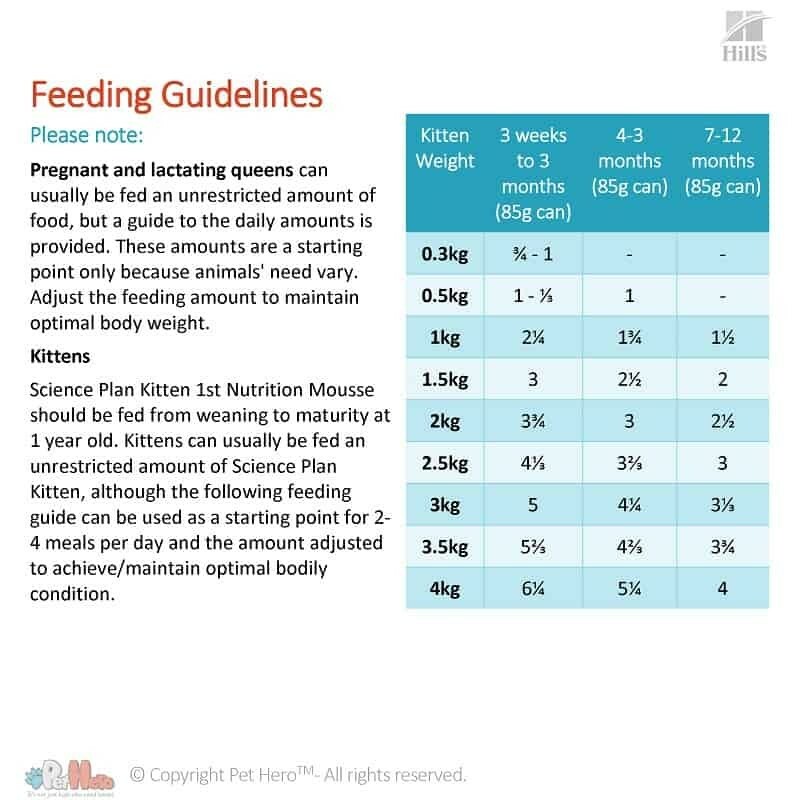 Omega-3 / 6-Are important for your Kitten’s brain development, immune system function and blood pressure regulation. Phosphorus – helps with the formation of bones and teeth. Is also needed for your kittens body to make protein for the growth, maintenance and repair of cells and tissues. Potassium – Your kittens body needs to work normally. Potassium helps nerves and muscles to communicate. Sodium – Maintains the cellular environment and prevents cells from swelling or dehydrating. Is also important for maintaining a proper nerve and muscle cell function. Vitamin A – maintains your kittens skin, teeth, skeletal and soft tissue and good vision. Vitamin C – Is involved in protein metabolism. Plays a vital role in wound healing, Antioxidant. Vitamin D – Keeps your kitten’s bones and teeth healthy, and support a healthy immune system. Order your kittens pet food online and have it delivered to your door.